I enjoy these relatively short dialogues by Stephen Fry, they delve into the hidden meanings & rich history of the English language in an informative yet light dissection. it's very good.best way to invest time when you are free . must read . Stephen is a good performer, easy on the ear and presents a humerus but instructive series. Will pass on to friends. 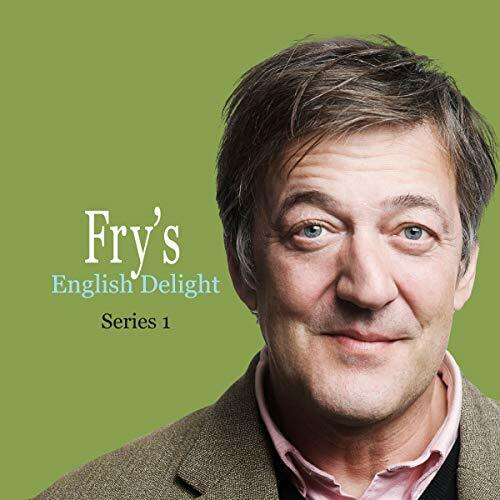 Stephen Fry and the rich tapestry that is the English language; it's hard to imagine that being a bad combination and this show demonstrates just why. Fry may be a bit of a posh bloke who admits to enjoying a pee in the shower but he's a national treasure as far as I am concerned. In this series he tackles puns and cliches with equal aplomb and I definitely learned a thing or two about the English language. A thoroughly pleasant and engaging listen. If you could sum up Fry's English Delight (Series 1) in three words, what would they be? Stephen Fry tells you loads of things you didn't know and never knew you needed to know till now. Wonderfully interesting. A highly informative series on a number of things within the English language, using a number of highly credible sources. There is very little of Stephen Fry compared to the sources speaking. It is still interesting to hear about the sources of words and phrases. You need to be in a mood to listen however otherwise the subtle humor can be lost on you. Very much for those interested in words than anyone else. A spirited and engaging narration coupled with Fry’s sage intellect makes this an exceedingly enjoyable audiobook experience. Sheer joy hearing Stephen Fry play with the English language. The whole thing is a tickle session for the ears. As usual an interesting topic discussed eloquently with Fry's unique added touch. A great listen.